The Axometrics Stokes Vector Polarimeter measures the complete polarization state of a beam of light. An easy-to-use graphical user interface provides real-time measurements of the polarization state and degree of polarization. The system attaches to you Windows-based PC via the USB port. This system is based on the well-known rotating-retarder design. This design offers unsurpassed measurement accuracy, and has reduced sensitivity to optical alignment allowing the measurement of free-space beams. 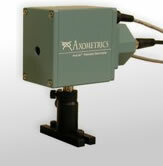 Axometrics also offers adapters for measuring beams from optical fibers. Axometrics uses the highest-quality polarization components available, precision-engineered opto-mechanics, and proprietary software algorithms to achieve higher measurement speed and greater measurement accuracy than competing polarimeter systems. Complete Stokes vector measurements are acquired and analyzed at 20 measurements per second. The AxoLite Stokes vector polarimeter is constructed from one of the two heads that make up the AxoLite Mueller matrix polarimeter. The Stokes vector polarimeter can be upgraded at a later date to the full Mueller matrix polarimeter.